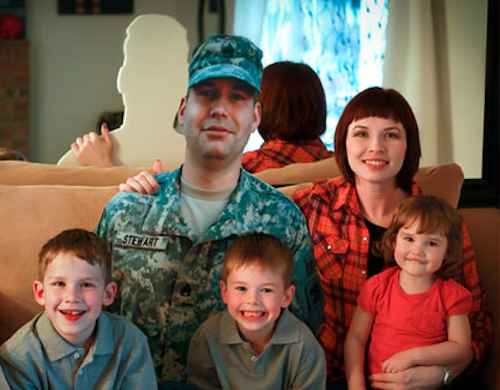 Before Jared left, Marissa saw a story about Flat Daddies—a group that provides large images of deployed servicemen and -women for their families—and decided a Flat Jared might help Jeff, Joel, and Mira through the tough transition. She ordered one, and the boys, then 6 and 3, fell in love with the cutout. They played games with it, dressed it in costumes, and propped it up at the dinner table. Marissa, 32, was surprised by the boys’ enthusiasm and wanted to share it with her husband. She started a blog called “A Year with Flat Daddy” and posted photos of Flat Jared, or “ FJ,” in funny scenes around Spokane, Wash., where they lived until last summer. From 7000 miles away in Ramadi, Iraq, the real Jared could check the blog and see himself still at play with his kids back home. “A Year with Flat Daddy” is now in its 27th month. Real Jared, 35, has been home for only one extended stay, while Flat Jared gets more wear and tear every day. He’s been trick-or-treating and even sledding in Spokane. He’s attended soccer games and the first day of school. He ran a 12K race on his brother Jordan’s back. He slides down slides, plays hide-and-seek, goes to the movies, and sits on Santa’s lap. “It’s good he’s gotten so beat-up, because it means we’ve taken him lots of places,” says Jeff, now 8. Although FJ provides solace at critical times, Marissa has faced many of the family’s toughest challenges alone. Jeff was diagnosed with Asperger’s syndrome two years ago and undergoes regular therapy. Mira was hospitalized with a severe rotavirus infection at 18 months. Marissa also had to take on part-time work as a transportation security officer to make ends meet. At press time, Real Jared was due home by Thanksgiving, more than two years after leaving his family. When he returns, Marissa says, FJ will go in the garage—but if rumors of another overseas deployment come true, FJ may need to come out again. To donate a Flat Daddy or Mommy to the family of a deployed service member or to learn more about the program, click here. EDITOR’S NOTE: After this story went to press, Staff Sgt. Jared Stewart returned home to his family. Read more about his homecoming at Marissa’s blog: A Year with Flat Daddy.